Marketing has evolved over the years, and the pace of technological advancement is admirable. The modern day buyer has also changed and is more informed, persistent, and a little harder to please. It’s become extremely challenging for organizations to nurture a relationship with today’s tech-savvy buyers. One of the ways we overcome the business-to-consumer gap is through user intent. User intent helps inform people about what the user is looking for when conducting a search. The concept of user intent in marketing is seeking to understand the content behind the keywords used in the search engine. Companies look at user intent to find out why customers are using a search engine and what they hope to find in the content that they look up. User intent is a marketing tool that greatly benefits companies by allowing them to better understand how to meet the needs of their customers. 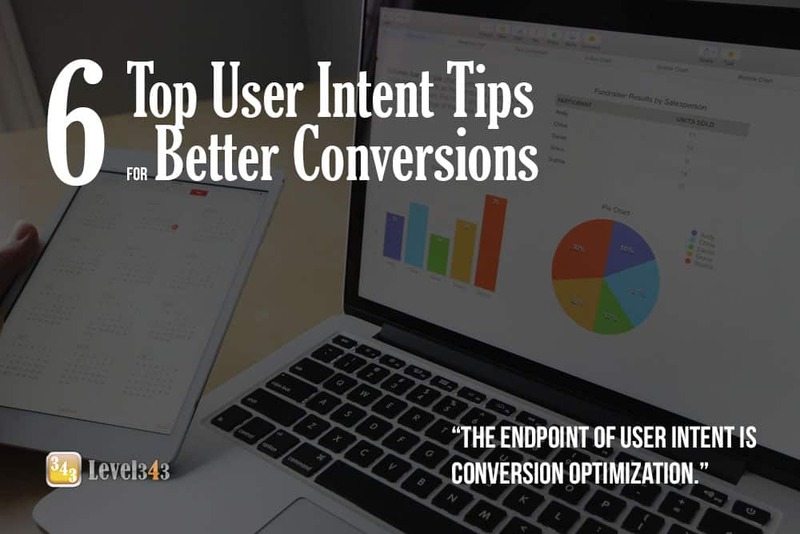 The endpoint of user intent is conversion optimization. Look at the features that attract users. Focus on what drives traffic. Using conversion optimization, you’ll have a good idea of the user’s intent. User intent defines what people are looking for when they are inquiring about something. There are multiple types of intent, categorized into navigational, informational, and transactional. Navigational – In this category, the user is looking to reach a particular destination. As a website owner, it’s your job to make sure that the user can easily get to that destination. Transactional – The user in this category is ready to buy something, sign up, register, or download something. They are looking for a site where there are interactions. Your objective is to ensure they’re successful in whatever they want to do. Informational – Here the user is looking for information and your work is to ensure they get the specific info they want. User intent helps organizations create a customer-focused culture and should not be overlooked. By figuring out the informational intent of the customer, you can find out how to deliver excellent content, stronger calls-to-action, targeted search snippets and a better site structure. In turn, this leads to more traffic and a healthier bottom line. Here are five tactics you can apply to capture leads based on intent. Why did the user visit your site? What were they looking for before they landed on your page? What term did they use to find your site? How long did they stay on your site? Where did they go after visiting your site? Did they use your website’s search to gather more information? If so, what terms did they use? What answers were they looking for on your page? Once you identify what users look for, it’s now time to create new content or tweak your old content to be more relevant and match the intent. Relevant content is useful in morphing a new buyer into a regular buyer. Every time they search for something and land on your site, you can optimize the content for your users. Questions help reveal the intent of your users, so look to create content that addresses the primary questions that the people may have. Once you have an idea of what people are searching for, you can create content that initiates dialogue. Place an emphasis on keywords. Creating content around keywords will lead to more variations of user intent. 3. Develop segmented landing pages and/or silos. A “silo” can be thought of as a topic hub. You develop a topic with several pages; each page provides more in depth information (think something like blog categories with related posts in them). For landing pages, each page should match the user’s intent, not just a way to showcase a product. Without some variety, you will not be able to gain their conversion. Identify your primary set of ideas around your core topics. These concepts will make up the basis of all keywords and your content. The concepts should be tied to the problems that your customers ask. If your content fails to meet users’ expectations, then it’s time to optimize it. How do you do this? The best way to optimize is to tell your customers’ stories and share experiences. Ensure you use trust-building words and add factual information to validate your claim. Modern buyers gravitate to businesses that offer exceptional customer experience, and optimizing will help you attract more traffic to your site. Make sure to read 5 Ways a Full SEO Audit Can Improve Your Bottom Line. An audit can help you pinpoint a lot of the issues your site may have that stops people from reaching your site and visitors from converting. An audit helps you get outside perspective about your organization, and investigating user intent will help you measure how customer-focused your website is. Once you pinpoint the flaws, take the time to fix them. We’ve had businesses come to us for optimization but didn’t do anything with the recommendations we gave them. It doesn’t do a whole lot of good if you don’t put what you find to good use. Don’t just sit around and hope that intent-driven marketing will attract users for you. Check back with your analytics and see what worked and what didn’t work. Look at your main performing keywords in Google Analytics. This can help you figure out where your content is not utilizing ways to fulfill the needs of your clients. If your content seems to be successful, but is not being seen by researchers, look at your keywords. Change your keywords to match up better with your content. Intent-driven marketing is complicated, no doubt. One of the hardest jobs of a marketer is to put themselves in the customer’s shoes. What would I search to visit this site? What kind of language would encourage me to click this link or follow that call-to-action? What colors and placements would draw my eye to the “Learn More” button? It’s not an insurmountable problem, however; it’s a matter of reading into data. When you decide to look at user intent for your website, make sure you have your data diving clothes on. Grab your Excel pants, Google Analytics shirt and Search shoes. It’s a long haul to really learn your visitors and potential customers, but it’s well worth the time spent (and the wardrobe upgrade). While you’re working to acquire a part of the market and keep a high customer retention rate, you have to make sure your content is important to your readers and can be easily found in search engines. Using the right semantic keywords – based on user intent research – can help you save time and money when creating new content. As we head into the future, user intent and quality are becoming a “hand-in-hand” marketing approach to create that customer-focused culture we talked about above. Find out what the user wants, is looking for, and what type of action they may take, create the content that matches, and watch your business grow. If you need help finding your data-diving wardrobe, contact Level343. We’ll help you step into your customers’ shoes for better website stickiness and conversions.